The Grand Staircase ascends from the hall, and the Throne Room is approached through an ante-room and the Green Drawing-room. The Throne Room is upholstered in crimson silk, and the ceiling decorated to represent the War of the Roses. The Princess Royal was christened in this apartment; and during the married life of the Queen the members of the Privy Council assembled there for their meetings. Since the death of the Prince Consort the Queen has held the Drawing Rooms there. The State Ballroom is a magnificent room on the south side. It is furnished with three tiers of seat s; columns of porphyry support the gilded ceiling, and the floor is of inlaid polished wood. The Royal dais is at one end. The Grand Saloon, decorated with designs of the flowers emblematic of the three kingdoms and acanthus leaves, is in the western front overlooking the gardens, which are extensive enough to insure a certain amount of privacy. The State Dining-room, where the notabilities are entertained, has a most ingenious contrivance for concealing the musicians who perform during the progress of the banquet, their gallery being divided by a thin wall of perforated metal from the principal part of the room. Corridors lead to the various suites of private apartments set apart for the use of any member of the Royal Family who may be visiting Her Majesty. 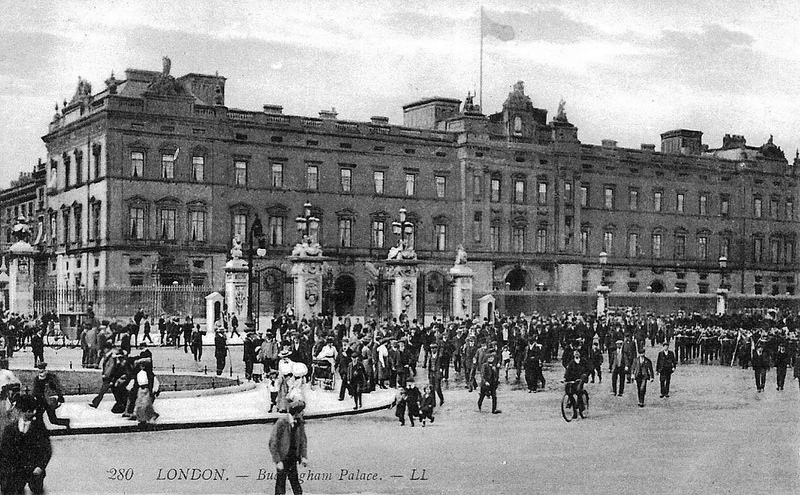 Those used by the Queen are in the north front of the palace, and communicate with the Yellow Drawing-room. The grounds, over forty acres in extent, are guarded from the eyes of the curious by walls surmounted by formidable-looking spikes. Within stands the Pavilion, built during the present reign. The most spectacular state banquet planned was that of Edward VII’s coronation banquet in June of 1902. No doubt the many heads of state anticipated the splendor of the banquet hall, which was 200 feet long by 75 feet wide, and was approached by the guests through a state hallway approximately a block long, richly furnished and decorated with paintings and porcelain. In the dining salon was a great collection of solid gold plate and huge gold ornaments…brought from the vaults for the occasion. One of three buffets contained pieces of plate too large or otherwise too cumbersome for use. These included one piece of great size taken from the wreck of the Spanish Armada. Royal chef Gabriel Tschumi and his kitchen staff spent days preparing the sumptuous banquet of six or seven courses, which included caviar and quails, as well as dishes especially created by Tschumi for the occasion, such as Côtelettes de bécassines à la Souvaroff (snipe cutlets covered in brandy, pâté and breadcrumbs, placed in a pig’s caul, and served with beans, truffles, mushrooms, and a Madeira and truffle sauce) and Consommé de faisan aux quenelles. Alas, alack, alas this amazing meal was not to be consumed, for on the evening before the ceremony, it was announced that the King had been struck down by appendicitis. On June 26, the date the banquet was to have been held, it was the poor of Whitechapel and not the foreign kings, princes, and diplomats who supped on the dishes created by the royal chef. *** Anecdote from Virginia Cowles’ Gay Monarch: The Life and Pleasures of Edward VII. I found an article in the New York Times where this occurred in a Berlin palace. Who sacrifices animals indoors??? That story sounds very sketchy. Well, the Shah of Persia did tell the Prince of Wales to get rid of the ugly women in the Royal Household and make the pretty ones his harem, and he offered to buy Lady Londonderry from her husband.